William Mitchell Ink Cartridges are standard replacement cartridges that contain waterbased ink. Ideal for general writing and calligraphy, they fit most brands of fountain pen and cartridge pen. 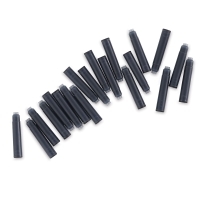 Choose 20 Black or an assortment of 20 that includes Blue, Green, Purple, and Red. 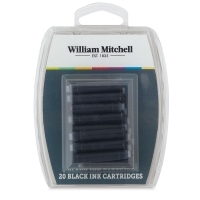 This pack contains 20 Black ink cartridges.